All handmade in the Dominican Republic, the fine cigars in our Romeo y Julieta cigar sampler are among the finest cigars we stock. All handmade in the Dominican Republic, the fine cigars in our Romeo y Julieta cigar sampler are among the finest cigars we stock. 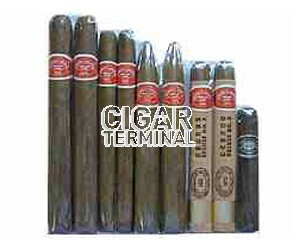 All these cigars are must try smokes, an assortment including one Romeo y Julieta Vintage No. 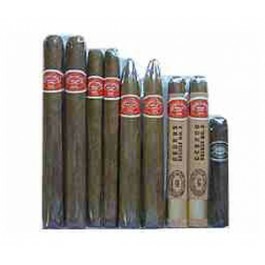 1 Lonsdale, one Limited Reserve Maduro Robusto, one Belicoso (6 1/5 x 52), 1 Lancero(6 1/2 x 40), 1 Viejo Vitola E, 1 Bully, 1 Churchill (7 x 50), and 2 Cedros Deluxe No. 2 (5 1/2 x 44).